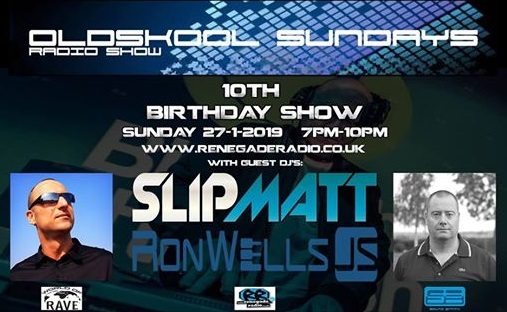 Janurary 2019 Renegade Radio 107.2 fm are proud to be celebrating Glenn Aston's Oldskool Sundays Radio Show 10 years on air anniversary! Special guests joining Glenn will be The Godfather of Rave DJ Slipmatt AND The Godfather & Pioneer of Jungle Techno Ron Wells PKA Jack Smooth . The TRUE Underground Vibes - Worldwide!! !